They'll be unveiling the C7 soon, I can't wait! Power is 298kw/405PS. Please correct it! The US didn't get anything with an RB engine stock. But many people (including myself a few years ago) have swapped RB engines into S13's and S14's. Though, in recent years, people have realized that an LS engine is a bit more ideal. If I still had my S13, there would be a forged, stroked, and FI LS2 under the hood. How common are the Rb engines in the USA, cos skylines werent sold in america. i didnt say the evo would win, i say it would be competetive. but the evo fq series is a different story altogether. the fq400 should be quite strong. it seems that Americans do believe that Muscle beats import. Seven speed manual for the C7 vette. Sigh, A stock Evo 8 or 9 would get destroyed by a base C6 in every way. 1/4 mile, road course. You name it. Again, not even worth discussing. The displacement argument is pointless because everyone gets their power a different way. And while the LS2 is six liters, it is lighter and smaller (exterior dimensions) than any RB engine. So you can bring up displacement, but it's kind of irrelevant and just another excuse. why cant displacement be used as an excuse? 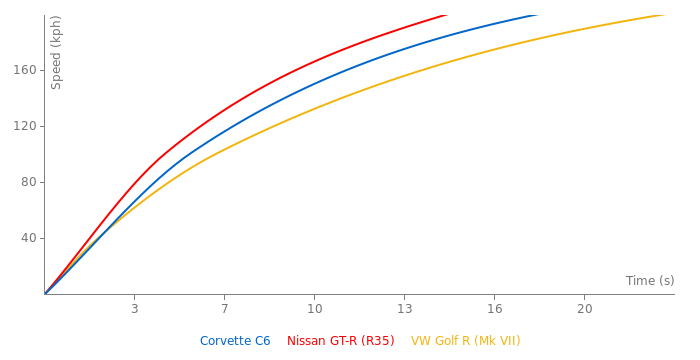 the horsepower and torque specs of the vette are higher than the r34 as well. also i think an evo 8n or evo 9 ( excluding the FQ models! 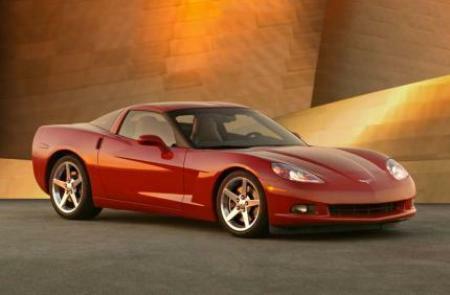 ), will be able to compete with a c6 around the track. Sure you can get an 11 slip, an 11.95, just not mid 11s like you said...but yes a C6 is faster than a R34. The C6 is a two seater sports car the R34 is a four seat large coupe with AWD. Not a contest. I clearly wrote "with just a tune." The LS3 has made at least 400whp with a tune only. And I figured since we were talking about already modified cars, such as a tuned R34, tires wouldn't be an issue, as they cost about the same as an hour or two on a dyno. I guess I should say tune and tires. Doesn't matter anyway. A stock R34 GTR isn't even close to a stock C6. I don't even know why this needs to be discussed. It's pretty obvious. Oh and Apathy a stock LS3 corvette cannot run mid 11s, come on...even with 400 rwhp they cant with road tires. I understand that "ricer"s arent all asian or asian cars, but when the term was invented that was what it meant. You dont mean it to be racist, but many Americans do, thats all i was saying. I'm aware of the gentleman's agreement. So you're saying a tune will make the R34 quicker? No crap. It's a turbocharged I6. Though, it actually would only make about 350hp or so, which would still put it behind the LS2 C6 on this page. But just so you know, the base LS3 C6's have gone mid 11's and made over 400whp with just a tune and I don't think tune only R34's have done that. I also wouldn't say the R34 would be quicker around a track if tuned considering the stock C6 is much faster everywhere and stops quicker and corners harder. Like I said, the R34 is a great car stock. But there's no getting around that BONE STOCK it is underpowered and a bit behind its time. Bone stock, they run flat 13's to high 12's. A stock Mustang GT is as quick or quicker. Just sayin'. LOL, i missed the last shot. At the end of the video it shows the time attack laptimes.. the Z-tune was almost 0,9sec faster, so not more than a sec after all. @Apathy: well to the R34's defense... Japanese car manufacturers officially weren't "allowed" to put more than 280hp in their cars.. Nissan kinda cheated on that one (so did Honda with the NSX) but that's why it lacks power. A light remap would put a R34 into a much higher HP-bracket and it would destroy a c6 vette around a dragstrip and track. The standard cars are not really an advertisement for what its about. With 350/400hp @4 wheels i think a c6 vette would struggle to keep up. The attezza 4wd is very advanced and would make more out of the power than you could in the Vette simple because in the vette you'd have to apply it more gently so not to upset the balance. Check out the Z06 holding up the Z-tune in this video.. it probably a sec faster if it gets a clear lap, probably more. Can everyone stop saying "ricers" it just sounds racist....say tuners or something. The R34 is nice, but it is dated and weak. 300 some odd horsepower was a lot from the 90's. These days average sedans are approaching those numbers, and V6 mustangs are exceeding them. A stock R34 is very good, it's just not as good as a stock base C6. As for displacement... is that anything more than an excuse? Excuses are for ricers, let the car speak for itself, don't make excuses for it. give credit where it is due. come on. there are many different tunes of the r34 from the s tune to the nismo version. the r34 was designed to give as much hp as one desires. plus the vette has the advantage of displacement! And there isnt many Z-tune skylines out there in the world, I think 20 total. They are more rare than some of the most limited and exclusive Ferrari models. This car would beat an R34 GTR spec II in just about every way. The only R34 that is quicker than it is the Z-tune. exactly. the on paper horsepower means nothing. take for instance the r34 z tune. Keith.. doesnt matter what the true horsepower is. Im talking about actual performance figures. The old GTR cost more than this and offered less performance.. although it was a awesome car. I actually like the old skyline better than the new GTR. the r34 is not really a 280bhp car. all japanese cars had a 280bph limiter. the r34 v spec 2 nur was detuned from the factory. The 280 horse R34 doesnt stand a chance against this.